Planning a party in Durham has never been easier! Planning a party in Durham has never been easier – honestly! Planning a party is often a daunting challenge but honestly, it really doesn’t have to be scary. Follow these great top tips for a stress-free, fun-filled party! About three weeks before the party, you need to think about invites. This could be bought from or shop, a text to parents or if you are having a Mini Mixers party you can download them here! Time, location and finish time if children are staying without parents. Extra details such as outdoor clothes for the farm or allergies for a Mini Mixers party as there are cupcakes to decorate! Make sure that your invited guests know to RSVP – you need to know they are coming. Its useful to leave your phone number or email address for parents can quickly reply to say they can make it. Perfect if you don’t know mum or dad too! Make sure if you haven’t got room at home or your aren’t having your party at a special venue you need to arrange hall or similar. Your local community has a wealth of amazing halls, community centres and church that are available hire. Expect to pay anywhere from £10-50 for a hall. Remember to ensure you book it for long enough! Your party might be 2 hrs long, but your entertainer (like me) needs to set up – its takes me at least 45 mins to be ready for the children. You then will be having party food which you will need approx 30 mins for plus tidy up time. Its a perfect way to set the scene with bunting, balloons, streamers or even just coloured table ware. 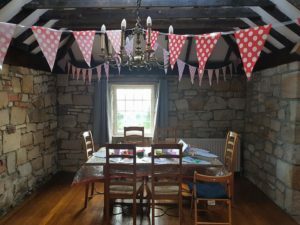 If you are having a Mini Mixers party, I bring table cloths to keep your tables clean – but if want to be able to sit straight back down for party food, save some time and put your table cloths underneath! Of course i love to make your childs cake so contact me to arrange this, if you have booked a Mini Mixers party you go get 10% off. If im not making yours, we love Costco cakes too, or pop into your locak supermarkets to see what they have available last minute. Tea and Coffee are always gratefully received by parents staying at the party, push the boat out with a biscuit or even a matching cupcake – you will be the talk of the school gates. I have even seen a parent have Sky Sports on in the lounge for the Dads….! The ideas for this are endless but personally, I like to keep it simple, how many times do most of the things are children excitedly receive end up in the bin days later? Remember to ask your little one to say thank you to the children for coming. Hopefully by following my top tips you will have a very stress free, fun filled party. Remember if it all gets too much, give me a shout. My bespoke parties can include as much or as little of the above as you need.